Unless you are one of those adventurous (not crazy) polar bear individuals who like to jump into an ice-cold pool, you perhaps want your pool to be heated. However, before you rush out and drop your money on a gas or electric heater, you need to consider getting the best solar pool covers. Not sure what they are, how they work, or how you can use them? You have come to the right place because we are going to look at how you can get the best solar cover for your pool and even review some top models on the market today. 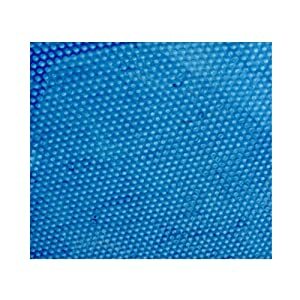 1.2.6 Splash Pools Round Solar Pool Cover 15 Ft.
1.2.7 Blue Wave NS482 12-Mil Solar Blanket for Round Above-Ground Pools 18 Ft. Solar pool covers are known by different names: pool blanket, solar cover, thermal blanket, and solar blanket – all of these names refer to an accessory that floats on a swimming pool and traps the sun’s heat to keep the water in the pool warm. Below are the different types of solar pool covers that you will get on the market today. Bubble Pool Covers – They come with thermal bubbles that capture the heat and trap it in your swimming pool. They reduce evaporation by about 95%. They heat the pool by about 15 degrees F.
Solar Sun Rings – They help to reduce evaporation and feature a UV resistant vinyl layer that helps to heat your swimming pool. Liquid Solar Covers – They are invisible and are applied to the pool to form a cover that other solar cover cannot match. They reduce evaporation by about 40%. You need to know what to look for when buying a solar pool cover. Here are some things that you should watch out for. Solar pool covers cost from as low as $20 to as high as $1,000. The price mainly depends on the quality, the size, and the brand you choose. Know your budget before you hit the market. Also, ensure that you buy from a trusted brand in order to avoid any future regret. Solar pool covers come in different grades of polypropylene or polyethylene material, varying in thickness from 8 to 16 gauge. These covers can either be solar rings or bubble covers. 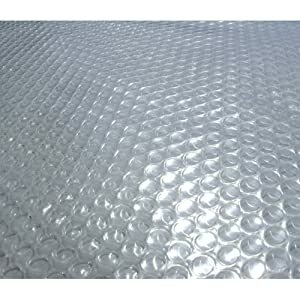 Bubble covers, also called solar blankets, are the most affordable and the easiest to deal with. 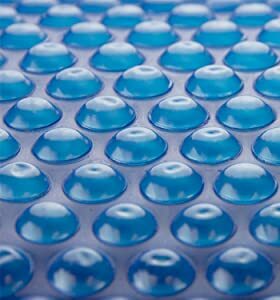 These covers have air bubbles which cover your swimming pool surface. They also help to trap the heat from the sun and prevent water evaporation. Bubble solar pool covers are UV rays resistant, sadly they only last for about 5 years. Bubble covers are lighter. Determining the size of your pool is a benefit for you. This will help you to buy a cover that can cover all the corners of your swimming pool. Therefore, you need to ensure that the measurements of your swimming pool are right in order to purchase the perfect cover. The rule of the thumb is the thicker your pool cover, the more heat it will retain. The thickness of pool covers varies from 8-16 mils or 800-1600 gauge. Thick covers don’t get blown away during windy weather, which is a benefit. However, the main downside is that they can be hard to roll up and are costlier than thinner models. Solar ring covers come in various print patterns while bubble models come in clear, silver and blue, or blue colors. Clear covers direct more sun’s heat into the swimming pool water. Silver and blue pool covers reflect the heat back into your pool water during the night. Blue covers are the best absorbers of heat. No matter the color you choose, all these covers are UV rays treated to ensure that they don’t get damaged by the sun. The clear one can last for about 10 years while the other two can last for about 6 years. The clear models allow visibility into your swimming pool, the blue limits visibility, while the silver and blue models block the visibility. Unlike the blue and clear covers that facilitate some heat loss during the night or in cool/cloudy weather, the blue and silver model prevents heat loss due to the silver color. 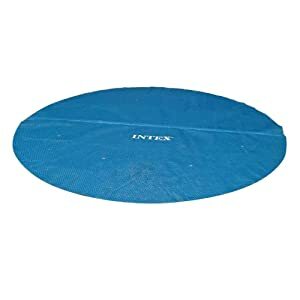 Intex Solar Cover for 12 Feet is a convenient product for your swimming pool. The cover is uniquely designed and made for a 12 feet round pool. Its’ one key feature is the air bubbles which transfer the heat to all parts of your pool. What more, the cover reduces evaporation by about 95% and it retains the high temperature of the water, eliminating the need for using water heaters to warm your pool. The cover also features some unique drain holes that prevent water from accumulating on top of your cover. Another thing that makes this cover a top product is the reusable carrying bag that makes it easy to store this cover. Dimensions: 144 x 144 x 15 inches. This pool cover was designed and made to fit an 18 ft. x 9 ft. rectangular swimming pool. It is constructed with 160 micron, which ensures that the water in your facility is always warm, making your swimming time a little bit more fun. The product comes with a convenient carrying bag that makes it easier to store when it is not in use. Weighing around 5.5 pounds, this product is very light. It doesn’t put pressure on your above ground swimming pool. What more, it offers value for your money. Dimensions: 108 x 216 inches. Easy to store and roll. Measures 18 ft. x 9 ft. The material doesn’t last long. This product is a must have since it saves you money, energy, and time. The blanket was designed with tiny air bubbles and reinforced flat seams that work together to transfer heat into your swimming pool water. It is able to capture the heat from the sun, transfer it into the water, and even prevent it from escaping. The cover also helps to minimize chemical loss via evaporation, saving you hundreds of bucks on costly rebalancing and chemicals. In The Swim 8 Mil prolongs your swimming session and is environmentally and economically friendly since it only requires the sun to heat the water. The best thing, you can easily trim or cut this cover to fit oval, irregular, or kidney-shaped swimming pools and it comes with a 3 years warranty. Dimensions: 48 x 12 x 12 inches. Easy to trim or cut to fit different types of pools. Sun2Solar 12 mil is made with tiny bubbles which help to capture heat from the sun and retain it in the water during the chilly days and nights. Its clear color enables the sun’s rays to reach the deepest part of your pool for a warmer swimming session. This cover also comes in handy as it prevents evaporation by about 95%. With minimal evaporation, you are saved lots of money and energy that you would have spent replacing the evaporated chemicals. The best feature, you can cut or trim this cover to any shape you want in order to fit your different needs. Trimming doesn’t void your warranty. Made with tiny bubbles for capturing heat. Easy to trim and cut. The size of this cover is a massive plus for pool owners. No matter how big your facility is, this cover will probably fit it and it covers the breadth and length of your pool effectively. In case your pool is smaller, don’t freak out since you can easily cut or trim this cover to the desired size. The cover also happens to be quite affordable and very easy to use. The other great feature of this pool cover is that it is very strong, durable, and firm, no matter the weather in your area. The cover comes in different colors, so you can easily choose your preferred one. Its air pockets are designed to keep your pool warm and prevent excessive evaporation of water. Dimensions: 38 x 18 x 18 inches. Effective in all kind of weather. It is simply a plain sheet – no attractive. Splash Pools Round Solar Pool Cover 15 Ft.
For a solar swimming pool cover in that price range, this cover is a great buy. The product lasts for a few swimming seasons without showing any sign of wear or tear, making it a durable product. This cover is designed and made to fit round, medium-sized, above ground swimming pools, and is able to increase the water temperature by about 15 degrees. Simply put, this is a great pool cover at the best price possible. In addition, the cover prevents evaporation which saves you the hassle of adding water and chemicals after every few days. Dimensions: 180 x 180 x 0.5 inches. Blue Wave NS482 12-Mil Solar Blanket for Round Above-Ground Pools 18 Ft.
Blue Wave enables you to keep your swimming pool warm during the cloudy days and cold summer nights. It features a thermal cell tech that uses insulated bubbles that enables your swimming pool to retain heat even when the sun has gone down. Effective and efficient, this product easily raises the temperature by about 15 degrees F.
The other notable feature of this blanket is the UV rays protection that enables it to remain outside for years without getting damaged. You will also be excited to learn that it comes with a 5 years warranty. Dimensions: 54 x 16 x 16 inches. 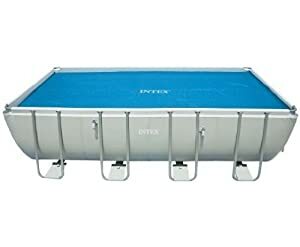 Heats the water by up to 15 degrees F.
Although any of the above solar pool cover can offer value for your money, we would pick Intex Solar Cover for 12 ft. Diameter Easy Set And Frame Pools as the best one because of its superb features. 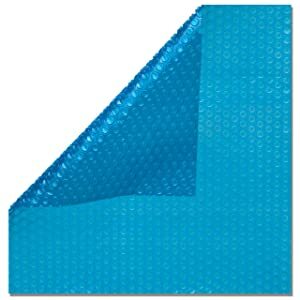 Some of these features include perfect for 12 feet round pool, air bubbles for transferring and retaining heat, reduce evaporation by about 95%, unique drain holes that prevent water from accumulating on top of your cover, and it comes with a reusable carrying bag that makes it easy to store. Solar pool covers provide a lot of benefits with the major ones being heat retention, preventing evaporation, and reducing the amount of chemical needed in your swimming pool. The best solar covers work to increase the temperature of your swimming pool by about 12 degrees F because they have tiny air bubbles or pockets that trap the sun’s heat and take it into your swimming pool water while also preventing this heat from escaping. Despite some swimming pools surface areas being large, they don’t retain the heat from the sun if they don’t have pool covers. A surprising 75% of your swimming pool heat loss is as a result of evaporation and these covers act as the barrier between the air and water to keep the water inside your pool. The best cover can enable you to reduce your heating expenses by about 70% since they convert sunlight into energy without needing any assistance. This often heats your pool by about 5 degrees for every 12 hours. A solar swimming pool cover can also be effective for indoor swimming facilities that lose heat during the night when the air is cooler. They do most of their work when the air is colder than the water in your pool by preventing heat loss during the chilly nights. The best solar cover does not only trap the heat but also prevent the water from evaporating by about 95%. If you reside in a dry and hot area, evaporation is often higher. Covering your swimming pool means that the pool will retain more water. One of the benefits of preventing water evaporation is reducing the amount of chemical loss. Pool cover prevents chemical wastage by about 35-60%. The reduction in chemical wastage means that you use less money to replenish them and even use your time to do other activities. Pool covers also keep out debris and dirt from your swimming pool. This means that you will not need to maintain your pool frequently. Q: How can I determine the right size of a solar pool cover to get for my pool? A: These covers often come in a wide range of sizes; some of them can be trimmed to fit your specific pool. When buying your pool cover, simply match the measurements to the longest and widest points of your swimming pool. Q: How long do solar covers last? A: If maintained properly, your cover can last for up to 5 years. This is really good considering that these blankets are extremely affordable. Maintenance involves removing your cover from sunlight during the hot seasons when you don’t really need to heat your pool. Some covers come with UV protection that prolongs their life-span. Q: What do solar pool covers look like? A: Solar covers come in all sizes and shapes and can be trimmed to fit your swimming pool. Some covers are clear, hence able to increase the temperature of your swimming pool by about 12 degrees F.
Q: How do I take my solar pool cover on and off? A: One of the few shortcomings of a pool cover is that you need to remove it after every use, and that is done by hand. Luckily, you can buy an add-on accessory that will install and remove the cover easily. If you cannot get an add-on, simply unfold your cover and install it using your hand and then fold it when you are done. The best solar pool covers are effective swimming pool blankets and the best thing, they are economical. They save energy by warming your swimming pool, without needing to use electricity. They also reduce evaporation by about 97%, which is the number factor for heat loss and chemical depletion. So, in addition to saving energy, a solar pool cover can conserve chemicals and water.